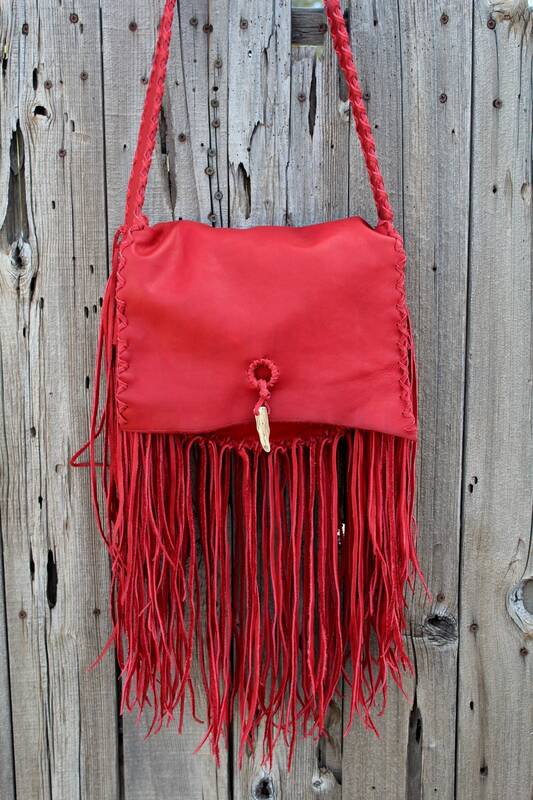 This fringed red leather handbag measures 9 inches tall x 12 inches wide and 2.75 inches deep. It features an extra inside pocket and one on the back of the bag. The shoulder strap is a comfortable flat strap measuring 48 inches . If you prefer a longer or shorter strap please contact us or leave a note at checkout. 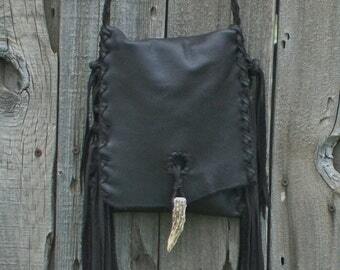 This red leather purse has an antler tip closure on the front of the bag. This item is MADE TO ORDER. Please read our policy on made to order items. Please allow 3 to 4 weeks to ship, sometimes sooner. All of the hides we use are one of a kind and unique. The color and texture of each hide will vary. Leather hides are a product of nature, blemishes and scars are part of the natural character of the leather. From time to time a particular color of leather may become temporarily unavailable. You may choose a different color from any of the listings you see in our store. When you purchase any item that is made to order it will not be exactly as the one you see in the picture. Because each hide is different and unique the lids and overlays on the shoulder bags and handbags will not be the same as the made to order picture, no two bags are ever the same. We will do our best to accommodate what you have chosen. If you see an item you like and would like it in a different color, size or style, please contact us. We make many things not offered here. We will work with you. Handmade in the USA by Thunder Rose Leather. I’m obsessed with this! I love it! Thank you! 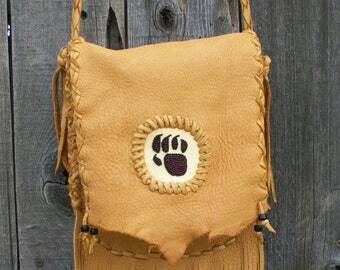 I received my beaded leather bag and I would like to Say it's even more beautiful then I thought it would be. These are so worth the money. I will be buying another maybe a few more for gifts. There so well made I love mine and so does my daughter as she tried to take it from me. I will be sharing this shop with family and friends. Thank you for such a gorgeous item. Far more beautiful in person. Rich buttery brown color with extra Chocolate fringe that I had ordered with it. Well made with care. Nice wide strap that crosses over and lays right on my hip. We accept PayPal and Etsy Direct Checkout for your credit and debit cards. If you are not happy with your purchase you may return it in its original condition within 7 days and we will make you another one or you can exchange it for something else in our store. Return shipping is on you. Our top priority is that you are happy with your purchase. We ship USPS priority and first class within the United States with tracking and delivery confirmation. Please be sure your Etsy shipping address and / or your paypal shipping address is up to date. We will ship to the address on your receipt unless you ask us to ship someplace else. We no longer ship items over $40.00 to countries outside of the US due to issues with lost packages, customs, insurance and misunderstandings. All of the hides we use are one of a kind and unique. The hides are not treated and we don't recommend that you treat the leather. It will probably change the color and feel of the leather. The color and texture of each hide will vary. Leather is a product of nature, blemishes, scratches and scars are part of the natural character of the leather. From time to time a particular color of leather may become temporarily unavailable and we may use a different type of leather in a similar color to fill your order. 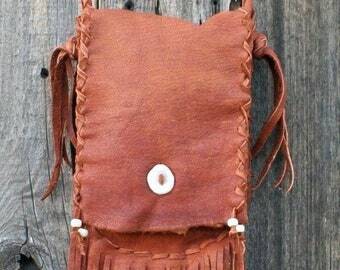 Because each hide is different and unique the lids and overlays on the shoulder bags and handbags will not be the same as the made to order picture. No two bags are ever the same. We do not suggest to use any treatment for our leather goods. Just let them age gracefully. If you need to wipe off dirt just use a wet washcloth.